Rancho Solano Private Schools expanded to include a fourth campus for middle school and high school students on Via de Ventura Road in Scottsdale, acquiring a commercial office building and the surrounding property. The first phase renovation included classroom and administrative space, completed for the start of the 2012 School Year. 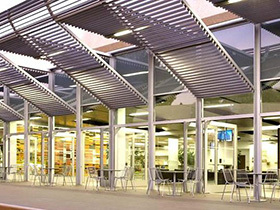 The modern, industrial design featured open ceilings and exposed systems requiring an acute awareness of the aesthetic nature of our material and quality craftsmanship. 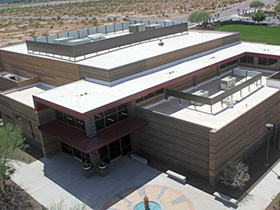 Immediately following completion of the first phase, the second phase of the design included an adjacent 25,000 square foot student center with gymnasium completed in March 2013. Rancho Solano was awarded "2013 Best K-12 Schools Project" by ENRSouthwest. The 111,700 square foot facility was redesigned to improve study areas, classrooms, library, and the below grade basement was redesigned to allow natural light to enter. The existing switchgear and generators were utilized in the lighting and power distribution, adding custom updated lighting solutions like specialized, low voltage LED fixtures integrated into a controlled system. 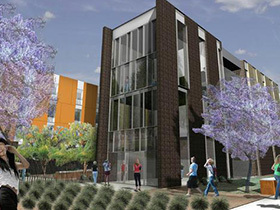 Built on the main Tempe campus, McAllister Academic Village is a 10-acre complex of ten separate multi-story buildings ranging in size from four-story to eight-story. The co-ed freshman dormitories house over 800 double occupancy accommodations with suite-style bathrooms on the upper levels above classroom space on the first floor. The 400-seat dining area offers five individual restaurant venues and a convenience store. 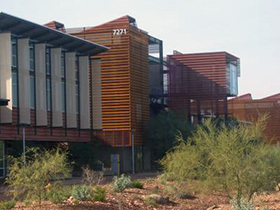 Consistent with Arizona State University standards, the building was awarded LEED Silver. 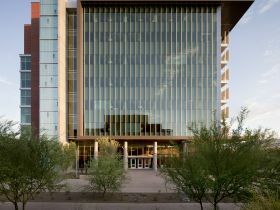 Awarded LEED Gold, the four story Interdisciplinary Science and Technology Building project at Arizona State University in Tempe was the first of a multi-phase campus expansion to provide state of the art teaching and research facilities. ISTB I covers 180,000 square feet and contains 34 laboratory suites, office space, and two levels below grade. We provided conceptual/schematic design development, schedule management, constructability and value analysis for the installation and integration of medium and high voltage electrical, telecommunications, and data systems. Typically, buildings are designed with two sources of power: one constant, and a second for emergency. This building was designed with five sources of power. The objective was to maintain a level of detail and redundancy to ensure ongoing operations at all times. Ground-up construction of 245,000 square foot complex contains multiple academic buildings up to three stories tall including laboratories, classrooms, offices, lecture halls, and a fine arts performance area. We provided all electrical installation and special systems integration including structured cabling, and Design-Assist preconstruction services included BIM. 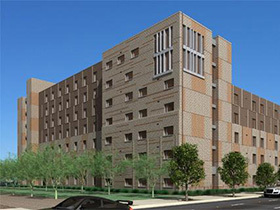 Barrett Honors Housing, Arizona State University - Six dormitory towers between four and seven stories are adjacent to a multi-level mixed use building, which includes classrooms, administrative offices, and a student dining facility. The development equals 563,000 square feet and can house 1,730 students. We provided Design Assist preconstruction services, electrical installation and distribution for the new construction, which earned LEED Gold status after initially targeting Silver. The building is structurally sustainable and environmentally friendly with utilities designed to conserve resources. 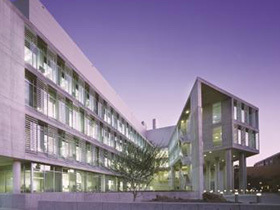 Interdisciplinary Science and Technology Building IV, Arizona State University - The long range plan for Arizona State University is to be the Southwest’s leading research center, pioneering innovative processes, inventing and utilizing the highest technology. Over the next ten years, the campus will add five new facilities to achieve this goal. Wilson Electric was proud to support Phase I and Phase IV. Phase IV is intended to be used as both classroom space and a professional, high-tech research facility, including 160 laboratories, auditorium, and administrative offices. The 294,000 square foot facility incorporated the highest level of technology for the School of Earth and Space Exploration. Our Design-Assist role included all electrical installation and distribution, site lighting, and low-voltage systems integration. We utilized BIM technology to coordinate the equipment installation required for internal operational systems. In addition to the multiple medium (5 kV) and high-voltage (15 kV) power systems supplying the building, generator power was also provided to add an additional level of redundancy for the critical laboratory experiments.